Nominate a Provider of the Year - Family Child Care, Inc.
Now, more than ever, we recognize the importance of family child care providers in the lives of children. 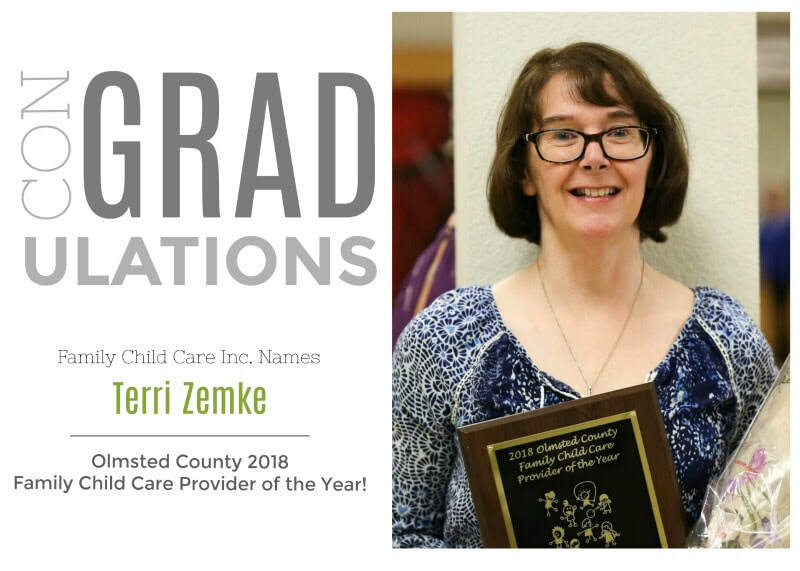 Please take this opportunity to nominate your child care provider in recognition and appreciation of the high quality of care, support, and professionalism that she/he provides to the families in her/his program and the field of family child care. Nominations are accepted year round. Nominees will be considered from January 1 through December 31 of each year. All Nominees will be announced & recognized at our annual provider appreciation celebration & banquet in May. May 5 - 11, 2019 is the Week of the Family Child Care Provider and a wonderful opportunity to celebrate the child care provider that cares for your child. Often times life is full and important thank you's are left unsaid. During this special week, take a moment to show your appreciation to your provider with a simple note of thanks, a picture your child draws especially for the provider, or simply delivering a muffin and coffee when you arrive with your child for a day. A simple token of thanks will surely brighten your providers day and he/she will know how much you value the love and care he/she extends to your children.